doi:10.1186/1471-2407-14-99 Cite this article as: Neiva et al. 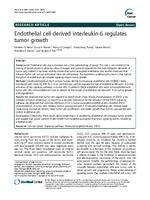 : Endothelial cell-derived interleukin-6 regulates tumor growth. BMC Cancer 2014 14:99. © 2014 Neiva et al. ; licensee BioMed Central Ltd. This is an Open Access article distributed under the terms of the Creative Commons Attribution License (http://creativecommons.org/licenses/by/2.0), which permits unrestricted use, distribution, and reproduction in any medium, provided the original work is properly credited. The Creative Commons Public Domain Dedication waiver (http://creativecommons.org/publicdomain/zero/1.0/) applies to the data made available in this article, unless otherwise stated. Supplementary Figure Legends Supplementary Figure S1. Blockade of endothelial cell induced STAT3 phosphorylation in tumor cells does no t affect Akt and ERK pathways, whereas inhibition of Akt or ERK ha s a compensatory mechanism HeLa cells were serum starved overnight and exposed to A HDMEC conditioned medium (CM) or unconditioned medium (EBM) for the indicated time points. In addition, H eLa cells were pre incubated for 1 to 2 hours with B 20 M Stattic, C 20 M LY294002, or D 20 M U0126, and then exposed to HDMEC CM or EBM for the indicated time points. Phosphorylated and total STAT3, Akt, and ERK levels were determined by Western blot. Supplementary Figure S2 IL 6 potently activates STAT3 signaling in cervical adeno carcinoma cells. HeLa cells were serum starved overnight and exposed to 20 ng/ml rhIL 6 for the indicated time points. Phosphorylated and total levels of STAT3, Akt, and ERK were determined by Western blots. A HeLa cells exposed to rhIL 6. HeLa cells pre incubated for 1 to 2 hours with B, 20 M Stattic; C 20 M LY294002; or D, 20 M U0126, and then exposed to rhIL 6 for the indicated time points.